There were many different types of gladiators who were divided into different classes according to their weapons and fighting styles. There were strict rules and protocol surrounding the fights of gladiators. The pairing of the different types of gladiators was important and ironically the Romans expected to see 'fair play' in the gladiatorial combats. 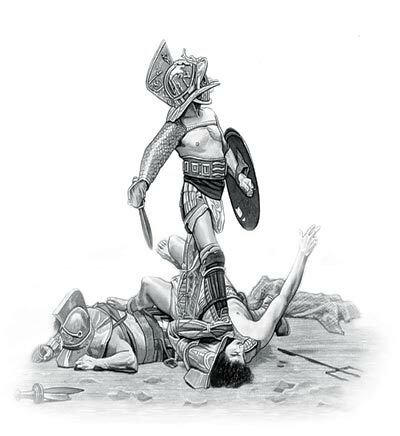 One type of gladiator might have freedom of movement but with little armor, or no armor to protect him. The other type of gladiator matched against him might be more heavily armed and protected but restricted in his movements by his armor. Types of Gladiators - How many different Types of Gladiators fought in Ancient Rome? How many different Types of Gladiator fought in Ancient Rome? Good question but we cannot provide a definitive answer. The history of the gladiators dates back over 2000 years and much of the information about them has been lost. We have, however, provided facts and interesting information about 26 different types of gladiator including their specialised fighting skills, their opponents and their weapons, clothing, armor and shields. The first Roman Gladiators were prisoners of war and were named according to their ethnic roots such as Samnite, Thracian and the Gaul (Gallus). Old enemies became allies and the names of the different types of gladiators changed to reflect their combat techniques such as Secutores (chasers), Bestiarii (beast fighters) and Retiarius (net fighters). The elite types of Gladiators were the Rudiarius who were gladiators who had obtained their freedom but chose to continue fighting in gladiatorial combats, the Tertiarius who were experienced gladiators who acted as substitutes if a gladiator was unable to fight and the Sagittarius, a rare delight for the spectators, as these were highly accomplished mounted bowmen. Each of this type of gladiator was well known to the spectators, highly experienced and extremely skilful. There were also unusual types of Gladiators. These types of gladiators were forced to fight, or specialised in, unusual types of combat or entertainment. The Andabatae (Sight Restricted Gladiators) were convicted prisoners who were forced to wear helmets without any eye holes. No other armor was worn. They fought bare-chested and blindly lashed out at each other until the last man was standing. The Bestiarii (Beast Fighters) were lightly armored types of gladiators and fought wild animals. The Venatores were Wild Animal Hunters who entertained the spectators with their hunting skills. The Praegenarii were the 'opening act gladiators'. This type of gladiator only used wooden swords, accompanied to festive music. The Bustuarii was a type of slave gladiator who fought in combats to the death at the funerals of prominent Romans. The Naumachiarii were combatants in sea-fights - the arena of the Roman Colosseum was originally able to produce such sea battles for more information see Water Battles at the Colosseum.